The Wells WV-FG ventless cooktop maximizes space by integrating a griddle and 15-pound fryer in a single unit under a hood system. Both the griddle and fryer have thermostatic controls, and the fryer has a manual reset thermostat. Half-size baskets are included for the fryer. With the stainless steel cabinet base, the operator can store essential equipment and supplies. It is accessible through dual-hinged cabinet doors. 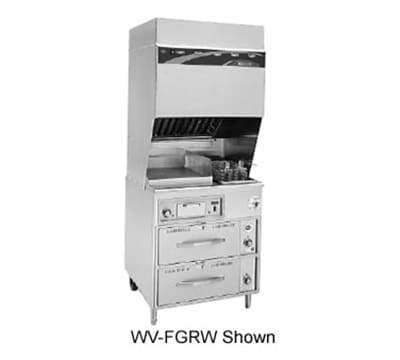 The Wells WV-FG fryer and griddle has self-contained filtration system. Four-stage filtration reduces emissions, while sensors constantly monitor airflow. When the filter needs to be replaced, the early warning system illuminates to alert staff members. The filter is removable without tools. This unit also has a fire protection system, and the manual pull in this system can be relocated. The interlock system does not allow the operator to use the fryer or griddle when the filter is clogged, not installed, or in the event of a fire. Adjustable front legs can be raised from 6 in. to 8 in.